This Safavieh Courtyard area rug is sure to add to the modern dicor of any home. Keep the contemporary look in your home with this indoor/outdoor piece crafted from plush synthetic material. This rug is comfy, machine-made, and stylish. Modern style meets quality in this geometric patterned orange rug. Interior design made simple with this contemporary Safavieh Courtyard area rug. Complete your home's contemporary design with this indoor/outdoor rug made of plush synthetic material. This rug is machine-made, which ensures a strong product. Maintain your modern home aesthetic with this geometric patterned red rug. This Safavieh Courtyard area rug infuses contemporary style into any room in your home. Decor done right with this indoor/outdoor piece, and its plush synthetic material. The machine-made construction of this area rug is sure to withstand wear and tear. Make a bold statement with this geometric patterned brown rug. 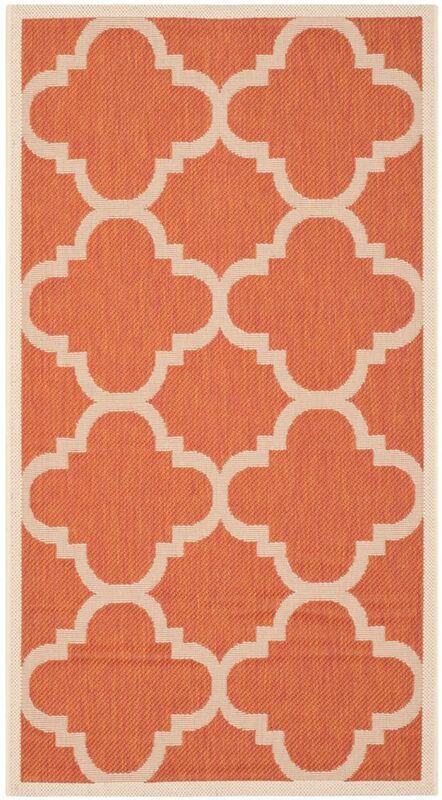 Courtyard Alex Terracotta 2 ft. 7 inch x 5 ft. Indoor/Outdoor Area Rug This Safavieh Courtyard area rug is sure to add to the modern dicor of any home. Keep the contemporary look in your home with this indoor/outdoor piece crafted from plush synthetic material. This rug is comfy, machine-made, and stylish. Modern style meets quality in this geometric patterned orange rug.